The blacklip abalone size limit between the South Australian border and the Hopkins River has been temporarily increased to 130mm to provide additional protection to breeding populations of recovering abalone. Recreational divers taking abalone in this area should continue using their yellow plastic abalone measures, but should use the 130mm measurement for greenlip to ensure they comply with the size limit increase. This temporary measure was developed at the request of the commercial abalone industry and in consultation with all stakeholders. The Control Area extended from the high water mark 1 km west of The Crags car park to the Killarney Beach car park. Fishing and diving activities in the Control Area were restricted to minimise the risk of human activity transferring the disease to unaffected abalone populations elsewhere in the State. The Control Area was replaced by a Temporary Abalone Closure, in the form of a Fisheries Notice under the Fisheries Act 1995. It was put in place to protect vulnerable and accessible abalone stocks that have been impacted by the disease from fishing pressure. The temporary closure remained in place until 31 March 2011, while monitoring of abalone recovery was undertaken. The closure was discontinued in recognition of the improving abalone populations and the allocation of commercial quota to these reefs. 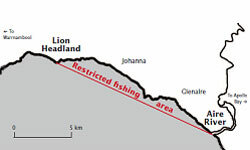 Waters between Lion Headland and the Aire River were closed to most forms of fishing from 26 June 2009 to 30 September 2009 and subsequently extended to 15 November 2009 . These control measures were were introduced to support the efforts of the Victorian Abalone Divers Association (VADA), Seafood Industry Victoria (SIV) and VRFish to curb the spread of the abalone disease. The closure included all marine waters enclosed by a line running from the southern most tip of Lion Headland to the mouth of the Aire River and extending to the high water mark between the two points. Vessels were still able travel through the area, however the use of anchors was discouraged. Other activites that were still permitted included surfing, swimming, diving (non-extractive) and walking along the shore/rocks. These temporary controls were implemented at the request of VADA, SIV and VRFish. Signs were erected at access points around the closure and flyers distributed amongst stakeholders. The abalone farms have all voluntarily disinfected and decontaminated. Sentinal trials at the two land based farms have shown that the decontamination process was essential. This process was overseen by the department. The farms have been permitted to restock in line with processes consistent with the National guidelines for translocation of aquatic animals. This includes extensive pathology testing and biosecurity arrangements.